The Murders in the Rue Morgue from Edgar Allen Poe’s Tales of Mystery and Imagination. I’m finding these short stories interesting, if not spine chilling, although some of the descriptions (as in this story) turn my stomach. This short story is the forerunner of the detective story, in which an amateur discovers who committed the crime through using his superior skill and logic when the police are baffled. and (horrible to relate!) the corpse of the daughter, head downward, was dragged therefrom: it having been thus forced up the narrow aperture for a considerable distance. Both bodies showed signs of brutal mutilation, vividly described by Poe. There are several people who gave evidence all differing about the nationality of the voices that they heard coming from the building. There is seemingly no way that the murderer could have either entered or left the room, or indeed the building. Dupin with his superior analytical skill manages to uncover the fantastical sequence of events that resulted in the murders and establishes the identity of the killer. 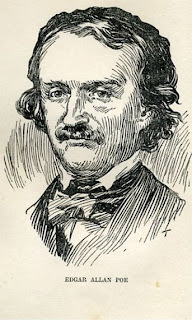 Poe’s style is detailed and to match the character of Dupin is detached and dispassionate. Apart from the horrific details of the state of the bodies there is nothing macabre in this tale. I could guess the identity of the murderer, but I think that’s because I’ve seen films and read books with a similar storyline – lifted from Poe, I now suspect. Dupin is not a particular likeable detective, but he uses his little grey cells in a manner much like Agatha Christie’s Poirot and, of course, Conan Doyle’s Sherlock Holmes. There’s something about ‘long, grey, bloody hair’ that’s particularly repulsive, isn’t there? Like you, I don’t find the stories very frightening, but they quite often succeed in being unpleasant. Yes, G-cat that is the right description ‘unpleasant’.I’ve read ‘The Fall of the House of Usher’ and ‘The Black Cat’ (very unpleasant) as well as the Rue Morgue and I’m going to see what ‘The Pit and the Pendulum’ is like next.